We often read and hear that to compete, manufacturers must become more agile, efficient and faster to market. Never mind what the business experts and gurus write and say. Just take a look at what Innovation Mold & Design is accomplishing. 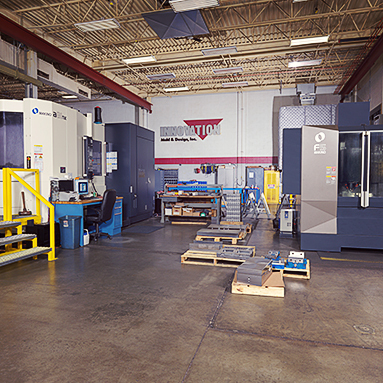 The Germantown, Wis., mold shop has transformed into a successful model of how to embrace advanced technology, hire more skilled machinists, diversify its customer base and enhance its precision mold machining capabilities. As a result, Innovation improved its mold build times, enhanced workpiece quality and significantly grew its bottom line. 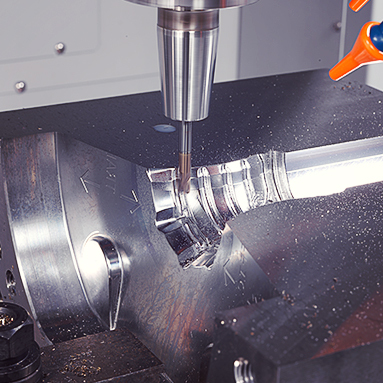 Milling tool and EDM consumable costs have been significantly reduced, from 5 percent of gross sales to 2.5 percent. What matters most to company president Alex Hermann is that Innovation expands with precision, high-performance technology. The company’s investment in six Makino machining centers and accompanying changes to programming and processes enable Innovation to achieve the aggressive goals set by Hermann. Sales increased from $2 million in 2012 to $6.5 million projected for 2016. This resulted from increased throughput and also the new capability to produce lens molds for automotive and other applications (traffic controls, commercial lighting), plus aerospace and medical parts. Skilled operators, programmers and engineers have been added, more than tripling the workforce to 29 while adopting an open-shift approach in which employees have flexible weekday schedules, and can program as well as monitor machine operations remotely with their smartphones and laptops. Lights-out machining occurs on weeknights and over the weekend. Nearly all secondary machining, benchwork and fitting have been brought in-house, turning what had been a source of added expenses and extended lead-times into a new profit center and a competitive advantage. In 2015, 30 percent of all molds had some processes that required outsourcing. In 2016, that number has been lowered to 9 percent. Time required for secondary operations has been reduced by days—and by a week or more on some projects. “In the last decade we’ve heard a lot about survival. That was never a part of any discussion I’ve had with Innovation. They always talk about growth. They always talk about the next project. It’s obvious from the minute you meet him [company president Alex Hermann] that he’s all about growth, performance and perfection,” said Lynn Bachman, sales engineer at SST. Innovation’s investments in precision and flexibility with the a81nx and F5 have enabled the company to eliminate outsourcing expenses by 60 percent. The automatic pallet changer on the a81nx has helped Innovation increase machine utilization by as much as 20 percent compared to previous commodity machines. Achieving tolerances of 0.0002 inches, Innovations U6 wire EDMs with HyperCut technology are able to complete parts in just one shot. Innovation’s tooling costs have dropped from 5 percent of sales to about 2.5 percent in the past year thanks to the enhanced rigidity of its new machines. Established in 1979, Innovation Mold & Design was a mature, profitable supplier of tooling and die/mold components, primarily to regional manufacturers of plastic injection-molded consumer products. The company had eight to 10 customers; one customer represented about 60 percent of revenue. Hermann, a 23-year employee, purchased the company in 2012 and quickly refocused Innovation to add the capabilities needed to win new business from a wider variety of customers, especially those in the automotive, aerospace and medical industries with demanding requirements for tolerances and surface finish. Today, Innovation has 43 customers, with most concentrated in those three new industries. 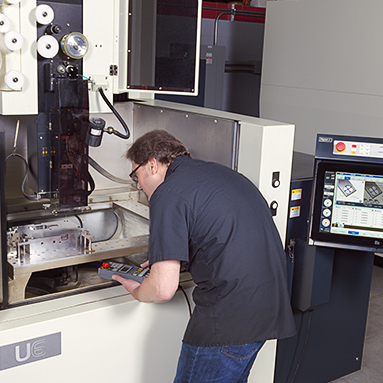 The company initially considered buying a horizontal machining center—a rarity in die/mold shops—in order to bring mold cavity applications in-house that had historically been outsourced. Innovation sought out SST, which distributes Makino machines and sells tooling and consumables to shops in North America, because he knew about Makino’s reputation for precision mold machining technologies. Their conversations, however, soon turned from horizontal machining solutions to wire EDM. Innovation’s leaders were frustrated with a commodity wire machine they had recently purchased that experienced repeated mechanical issues and failed to run unattended as Innovation planned. A purchase order for a second commodity EDM was canceled due to nagging problems with wire threading on the first machine. Innovation then purchased two U6 wire EDMs from SST, installing them in June 2015. The impact was immediate. Innovation now produces more mold components with less wire. Consumable costs are down 1.5 percent of total sales compared to the commodity EDM machine previously used. Innovation didn’t forget about adding horizontal machining. 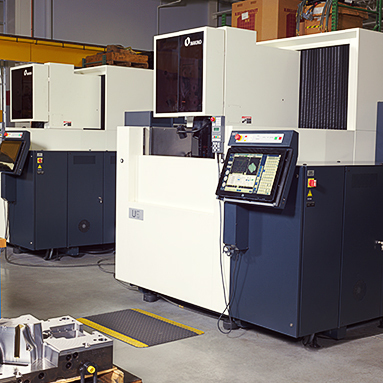 In July, the company purchased an a81nx, along with two vertical machines: a Makino F5 and PS95. A second PS95 was purchased in October, completing the whirlwind expansion cycle. How the company selected the a81nx illustrates the relationship and partnership that developed between Innovation’s team and SST. Engineers from SST took Hermann and his leadership team to other shops nearby to see horizontal machines in action. SST worked with Innovation to define the purchase decision not around the machine price but how closely the machine matched Innovation’s application and process requirements and the total cost of ownership. Consumable costs are down 1.5 percent of total sales compared to the commodity EDM machine previously used. SST’s recommendation combined the a81nx with tooling, work holding and programming that better matched the cavity components Innovation sought to bring in-house. The a81nx has a duel pallet changer that makes setup and loading efficient. The bottom-line impact from 2015 to 2016: Expenses for outsourcing are down 60 percent. The dependability and predictability of the Makino machining centers are most important to Innovation’s production managers and operators. The company runs the machines unattended over nights and weekends whenever possible. As a result, some mold builds that had been scheduled for eight weeks using the company’s previous commodity machines are now produced in four weeks. The time needed for hand polishing has been cut by 30 percent because the four CNC machines hold tight tolerances. The F5 and a81nx cut feature tolerances repeatable to 0.0001 inch. In several applications, the PS95s produce perfectly even tool blends across nearly half a dozen cutters, eliminating nearly all hand fitting of shutoffs and parting lines. The U6 wire EDMs yielded surprising early results, said Innovation Operations Manager Mark Shaw. In one of the first jobs Innovation produced on the new machines, the company’s quality lab reported components out of tolerance by as much as 0.0005 inch. Operators and production managers checked and rechecked the U6 setup and program. They called SST, which dispatched its engineers, who confirmed during an on-site visit what Innovation’s team had already determined. The programming was correct, and the U6 machines produced the components properly. “The U6 machines were cutting to within 0.0002 inch. We discovered that our vision-based coordinate-measure machine [CMM] was not as precise as the Makino wire machines. We were getting the parts we need from the wire EDMs from the first shot,” Shaw said. Innovation tracks machine uptime, which has improved by as much as 20 percent because the Makino machines operate reliably, compared to the company’s commodity VMC machines. The performance measurement that matters more to the company’s leaders, however, is how much the Makino machines enable lead-times to be reduced. Capacity is more important to Innovation than machine utilization, which is currently at about 60 percent, providing the company with capacity to add new business. It used to take up to 10 days for some lens mold components featuring complex bezel geometries using the company’s previous commodity machines. Today that run time is as low as two hours. Innovation combines runs on a PS95 for roughing cavities and the F5 for precise component details. The speed and accuracy of these machines, in conjunction with new programming and processes designed (with support from SST) to run in coordinated ways, make such a huge improvement possible. 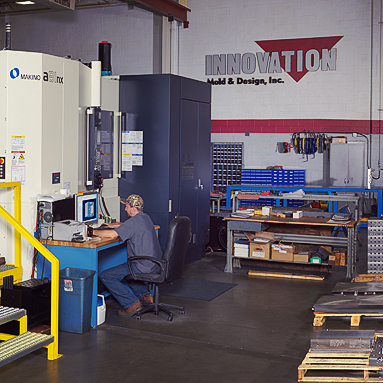 Central to Innovation’s growth strategy is making sure the machining centers are optimized with the right combinations of cutters, shrink-fit tool holding, work holding, programs and processes. SST proved to be the perfect partner to accomplish all of this, said Jim Paulsen, Innovation’s vice president. “They really know my business, and SST with Makino has the full package of machine and tooling. They also provide ideas about our processes and programs. They really put you in a position to succeed,” Paulsen said. 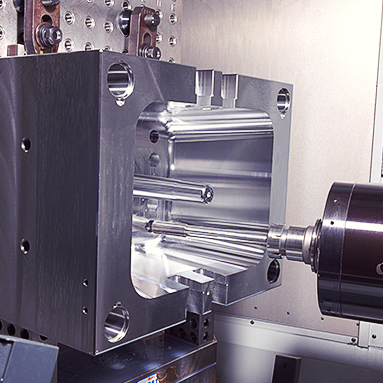 SST and Makino engineers recommended tooling and work-holding solutions customized for Innovation’s specific applications that yielded significant increases in efficiency, accuracy and contribute to longer tool life. By collaborating with SST, Innovation was able to calculate its ROI not just on the purchase price of the six machines but also on overall reductions in costs for consumables, tooling and maintenance plus improved machine efficiency and quality. Innovation’s tooling costs have dropped from 5 percent of sales to about 2.5 percent in the past year. The company has brought all roughing and nearly all other outsourced work in-house, eliminating significant expense. Moreover, because of the precision mold machining capabilities, hand polishing has been reduced by more than 30 percent.